Direct-to-consumer retail is becoming increasingly mainstream, as more digitally native brands move from online to off with brick-and-mortar flagships, popups and showrooms. Since its arrival in 2014, footwear startup M.Gemi has become one of the most notable DTC brands on the scene. As footwear presents its set of unique challenges related to fit—with many online retailers fielding untold returns—the category impels physical retail experiences. M.Gemi has pioneered the showroom model, in which a store avoids issues of inventory management by offering in-store try-on with ship-to-home service. This offers high-touch retail experiences in an environment that allows customers to test and get to know the brand, making them more likely to become ecommerce customers in the future. 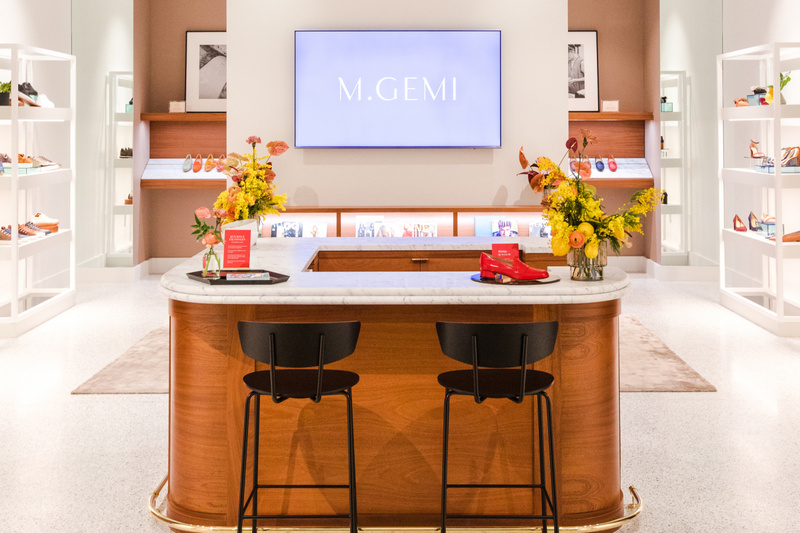 In its first permanent New York City space, M.Gemi is among the DTC retailers setting up camp at Hudson Yards’ “Floor of Discovery,” a level of the new lifestyle and retail complex dedicated to brands born online. PSFK spoke to M.Gemi’s co-founder and president, Cheryl Kaplan, about the brand’s unique approach to accessible luxury and how even a transaction that ends in a return can lead to long-lasting customer loyalty. PSFK: What gaps in the marketplace led you to found M.Gemi? Cheryl: At M.Gemi, we saw footwear as an entrance into an Italian lifestyle brand that we wanted to build. We noticed a white space for highest-quality, truly handmade Italian luxury and premium service, minus the price. We knew that if we showed that to the customer in a different way, in the direct‑to‑consumer model, that we would be able to hit all of those components. It seems like you’re redefining luxury through this DTC experience. How do you communicate all of the value and the craftsmanship that goes into these shoes to the consumers? The brand and the storytelling is at the forefront of how we think about every shoe we make. Why did we make it? What’s unique and different about it? How are we going to tell the customer about it? We’re a very collaborative organization. We make sure that when the shoe design team is conceptualizing something, that the creative and marketing teams understand the ethos of the design, so that they can then bring it to life. We bring it to life through video, imagery, email, social media and also our stores—our fit shops. We build them out in a way that feels more experiential than just a transactional, go-in-and-buy-a-shoe journey. At every touch point we have, we make sure we’re hitting on why it matters and establishing an emotional connection to the brand. You’re opening a new store in Hudson Yards. Could you explain this choice? We’ve had a few different fit shops in New York. We’ve learned a lot about what works for us. Hudson Yards has a little bit of everything, which makes it a true lifestyle neighborhood. Whether people are shopping, living there, working there, or they’re working out there, they’re being entertained there—there’s a reason to be there. It’s not just a shopping mall, it has so much more. It’s about the experience. We love that people who are New Yorkers will be there, but also it will be a destination where people come from all parts of the country. It’s going to be a great cross section of people. For us, when we open a fit shop, it’s very much about showing up where our clients are. Is this your first permanent brick-and-mortar location? Yes. We’re very flexible in the way we open our fit shops. We’ve done everything, including mobile trucks that travel around weekend by weekend. It’s fun. It started off as a summer campaign. We call it Andiamo. It was a gelato truck, an old Italian truck that we rebranded. It initially started as, “We’re just going to do it on the weekends throughout the summer on the East Coast,” but then it was so great. People loved it. We served gelato, but also had shoes. People could try them on in the back of the truck. We started using it as a way to test other areas. The truck’s been to Texas, Chicago, D.C., Virginia. We also tried it out in some mall centers. We set it up inside in the winter at some locations. Hudson Yards is the first permanent one. The confidence in that came from all the learning that we’ve gotten in the different areas and the different types of stores that we’ve built out. The Hudson Yards store will have an Italian cafe in its concept, right? What inspired that? One of the things that we saw early on in our SoHo fit shop was the potential of an experiential store. People were coming in and they were trying on shoes, but they ended up staying for extended periods of time. It wasn’t in and out. They’d come with a friend. They’d have a coffee or we’d give them a glass of Prosecco. It really became a friendly environment. They got to know our sales associates. What we found was by keeping them comfortable and engaged in the experience, that they’d try to learn more. They were a little bit more experimental in the shoes that they would try. Sometimes if you’re buying it online and you’re going to try a new brand, you buy one pair of shoes, you see how it is. Here, they’re like, “While I’m here, I’m going to try on that over‑the‑knee boot that I might not have spent money on online.” Even though they don’t buy everything at that moment, they’re getting more familiar with the brand and trying more things. They’re more fully engaged. The coffee bar was an example of making it feel like something much more than a store. It’s a place where, even if you’re shopping with your friend or your husband, they have a place to sit down and enjoy. For opening weekend, we’re going to have a mini gelato truck. The plan is that every month we’re going to have community events and find ways to bring people in for reasons other than just to buy shoes. Will you offer any related services in addition to the cafe and events? Customers can sign up for the VIP treatment. They can go on to this reservation service, Resy, and make an appointment. We can pull out the shoes in their size and get it set up for them when they want to come. It’s just very high-touch. Beyond that, we’ll do events and community work with partners that may or may not be services. We’re also looking for ways to have different artists participate in what we’re doing. Could you explain how the Monday shoe drops increase engagement and excitement in this space? Part of our concept of reinventing the luxury footwear category was that most of our competitors are launching shoes seasonally. We have this opportunity to utilize a very rapid supply chain. Right now, we’re designing for June of 2019. Most brands are designing for June of 2020 or at least fall of 2019. By having this rapid supply chain in our office that is in Italy on the ground, we don’t have to take as much fashion risk. We can utilize customer data. If we see a trend in the market, we can take advantage of that. By not having to produce a full season’s worth of product and drop a new shoe every Monday, we can be learning all the time and adapting that in-season. What happens on Monday can impact a Monday in a few weeks. It’s amazing. Every buyer in the country would love to be able to do that. It also gives our customer reason to come back and check in. We always say, “We don’t expect you to buy every day,” but we want her to come in and see what’s happening. We wanted to take an industry that’s been around forever and mix it up, make it more dynamic. We have to evolve with what the consumer wants. Consumers don’t think seasonally. You don’t need a sandal in December or January. This whole concept of buy‑now, wear‑now is so real for us. We want to take advantage of not only the customer data, but also the opportunity to implement it. Can you describe your supply chain and how you’re able to turn around designs so quickly? A big part of it was that some of the bigger brands had left Italy. They went to countries where they could make it for less or for all different reasons. What happened was some of these workshops left behind had capacity. Some other brands come in, and they do a season, then the workshops go quiet. By partnering with them and working on our many cycles, we help them. For us and for them, it’s good. It’s steady business. Who is your target consumer and how do you establish an ongoing relationship? Our customer could be any age. We’re generally targeting a young 30‑something, but I would say that our customers are interested in style at various ages. They love to discover a new brand. They’re not about having to have the label but like beautiful things and appreciate the craft, and the design and the details. On your website, you offer a two‑minute fit consultation to online shoppers. How does that work and how does it help increase shopper confidence? We set out, even before we opened our first fit shop, to figure out how to remove as many hurdles as we can. At the end of the day, it’s footwear. Like swimwear, jeans, and bras, they’re hard. Free shipping, fast shipping and free returns was where we started. That was like table stakes. Beyond that, we added exchanges as a functionality. If customers buy a pair of shoes that are a little bit too small, they can go on the website or call us. We’ll send out the other size immediately. They can have them both at the same time and compare, or they can send them back. We’ll already be sending out the other. It also helps people not buy two sizes because, obviously, that’s costly. In terms of the customer service piece, that’s the biggest hurdle. It’s why our phone number is everywhere. It’s why our live chat icon is there. The Fit Consult, up in the top, was there for that exact same reason. I don’t measure customer service in how long someone’s on with a customer, or on a contact or ratio. There are all these old-school metrics that people use. What we want to do is make sure that we’re helping them. It’s about building that relationship with the client. We know that if someone engages with us, they are that much more likely to have a good experience. It’s why we ask customers for feedback. It’s why we reach out to people through our Net Promoter Score surveys. We are constantly looking for clients to engage with us, because even if they bought a pair of shoes and they returned it, if they talk to us they could end up being a great lifetime customer. Even when you have a bad experience that’s turned good, that’s the one you tell everyone about. M.Gemi is using optimizing customer service both on and offline to better suit today’s fluid consumer dynamics. For more from similar leading brands, see PSFK’s reports and newsletters.